The leader of Conservative party of Russia Lion Grigorevich Ubozhko has died. Lev Grigorevich Ubozhko has died on Tuesday on August, 19 at 14:37 on 71-st year of a life. 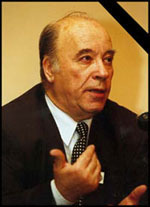 The leader of Conservative party of Russia Lev Grigorevich Ubozhko has died. Lev Grigorevich Ubozhko has died on Tuesday on August, 19 at 14:37 on 71-st year of a life. Civil funeral has taken place on August, 22, in Elohovskom the Cathedral (Moscow, m. Baumanskaja). Was left Grigorevich Ubozhko the founder and the leader of Conservative party of Russia which in September, 2001 was preobrazavana from political movement with the same name. Since 1968 Lev Grigorevich Ubozhko started to take part in increasing democratic movement together with A.Solzhenitsinym, A.Saharovym, V.Bukovskim, etc. For the political convictions has lead in jails more than 17 years. It is rehabilitated on October, 10, 1991 by plenum of the Supreme Court of the USSR. " The democratic Union ", since 1990 - chairman of Conservative party of Russia was left Grigorevich Ubozhko one of organizers of a party. Was the participant of the Constitutional meeting and a member of Public chamber at the president of the Russian Federation. In 1996 was nominated the candidate to an office the president of the Russian Federation. At conference taking place Harrogate chairman of a party David Devis has declared, that its policy will be "more liberal". In D.Devisa's opinion, social policy should be simultaneously wider and more address. " Ministries of Health, formations and justices pay insufficient attention to the most vulnerable members of our society ", - D.Devis has told. I shall be completely loyal in relation to the new leader and in every possible way it I shall support ", - it has added. Conservative party of the Great Britain for the first time has accused prime minister Toni Blair that it has leaded into error members of parliament concerning so-called " the Iraq file ", informs ITAR-TASS. In this document the data of the British investigation on the weapon of mass destruction in Iraq on the basis of which the decision on connection of United Kingdom to power operation of the USA against Saddam Hussein's mode was accepted contained. By words of "shadow" Minister for Foreign Affairs from tori Michael Ankrama, " the prime minister has leaded into error the House of Commons ? And that fact that it has made it or is deliberate, or inadvertently does not play any value ". Earlier former minister on questions of the international development Clare of Blinkers and the former leader of the House of Commons Robin Cook, was accused by Toni Blair of falsification of " the Iraq file "